WATCH: Should Billy Sharp's second goal against Aston Villa have stood? 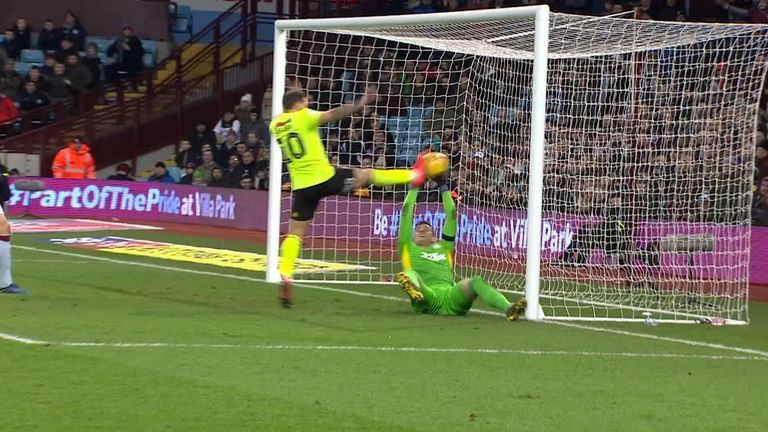 Sheffield United striker Billy Sharp scored a hugely controversial goal against Aston Villa on Friday night as it appeared he kicked the ball out of Lovre Kalinic's hands. After the stopper had parried Kieran Dowell's initial strike eight minutes into the second half of the Sky Bet Championship clash, Sharp was given a second bite of the cherry as Gary Madine's looping header bounced off the inside of the right-hand post and back into play. The striker appeared to get to the ball ahead of Kalinic and stab home, but replays suggested the goalkeeper had both palms on the ball and, as such, the goal should not have stood. Upon further inspection, the replay also showed the 33-year-old was offside in the build-up to the goal, though that was also not picked up by the officials at Villa Park. Derby defender Curtis Davies joined Scott Minto and Keith Andrews in the studio for the game, and offered his thoughts on the situation after the full-time whistle. He said: "Once he [Sharp] sticks his foot out, he becomes active because the goalkeeper could think he's going to get a flick on it, so I totally understand why that part was offside. "But here this is a typical one where, if I'm the defender, I want it disallowed. I'd have to say he had the ball between his hands. I think he [Kalinic] will be disappointed with himself for going to ground, but I'd have to agree if that's the rule. "Fair play to Billy Sharp, he hasn't taken the chance and he's got a goal from it. It's not for him to make that decision, it's the ref and luckily for him, the ref didn't make that decision."